All of the known photographs of Cadia Village are dated to the twentieth century, the second mining boom for Cadia. For the first stage of village development in the 1860s we rely on historical documentation and archaeological evidence. This photograph was probably taken after 1914, since the Post Office is indicated on the right hand side of Chilcott Street. One of the earliest descriptions of a settlement at Cadia is provided by the 1861 Inventory. It mentions houses for the Refiner, Captain, Carpenter, Engineer and Manager, as well as one double house and three single houses, with dimensions and valuations for most of them. 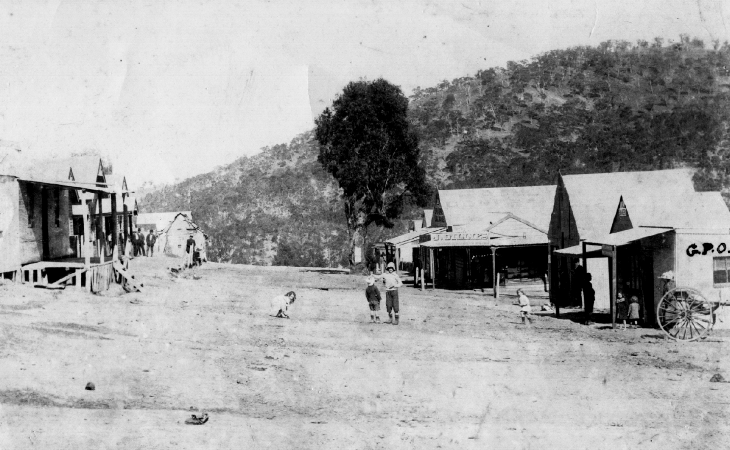 Although the mine had closed, the Village lived on until the 1940s, serving the mining community through its ups and downs, as well as the surrounding agricultural and mining district. These brief historical reports, mostly derived from newspapers and directories, reveal little about the Cadia community and who lived and worked at the mine. To fill out the human story we need to explore in more detail the historical and archaeological evidence.